Seasons are changing, sometimes Winter, Fall, Summer, Spring or too hot, windy, Snowing like here in Canada. Don’t worry, no matter what the Season is, Outside the temperature is, what the weather condition is, but with the right Rustic Bedding and Cabin Bedding, you can easily be transported to the World of your Choice. For example Luxury Lodge in the Wild, Cozy Cabin in the North Woods and the Wild West. By choosing the Best Bedding, you can create a Place of Comfort and Delight. 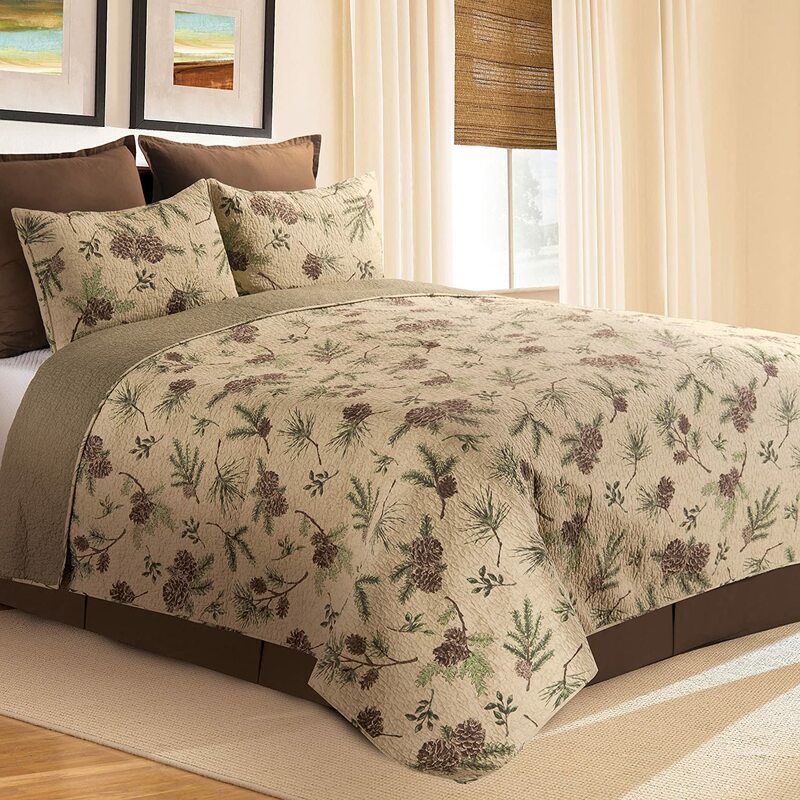 Transform your bedroom into a cozy and soft retreat with this 3 piece quilt set. The set is made of high quality polyester with a soft brushed microfiber feel. Quilt has a thin breathable design, which is ideal for warm sleepers, cabins, beach houses, cottages, camping, and warm climates. The quilt could also be used as a coverlet, Blanket Throw, camping blanket, or on picnics. The design also features evergreen trees and plaid sections in earth tones of Green, and shades of brown and tan. The thinness makes it easy to store and transport. This set includes full/queen bedspread and 2 pillowcases. 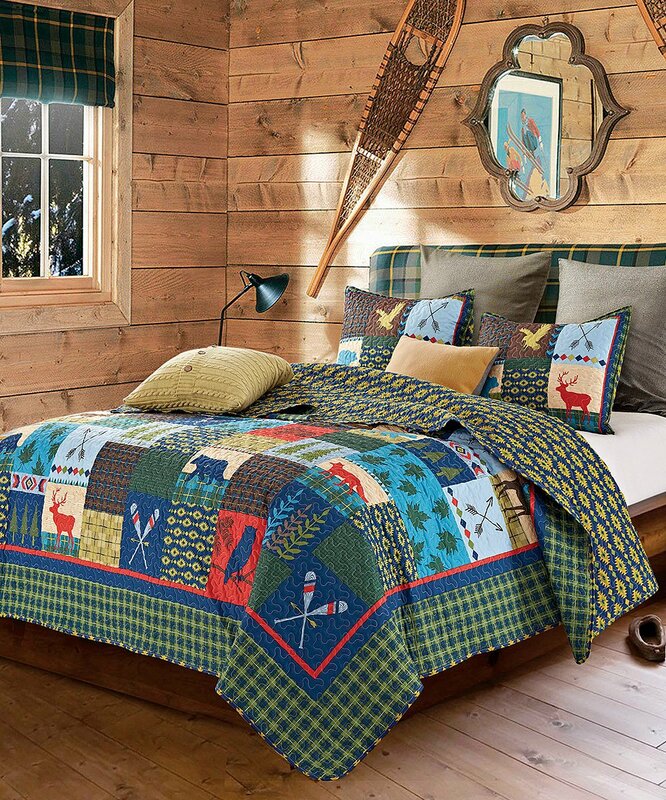 Give your home the Lodge look that you love with our selection of Cabin Bedding and Home Decor. 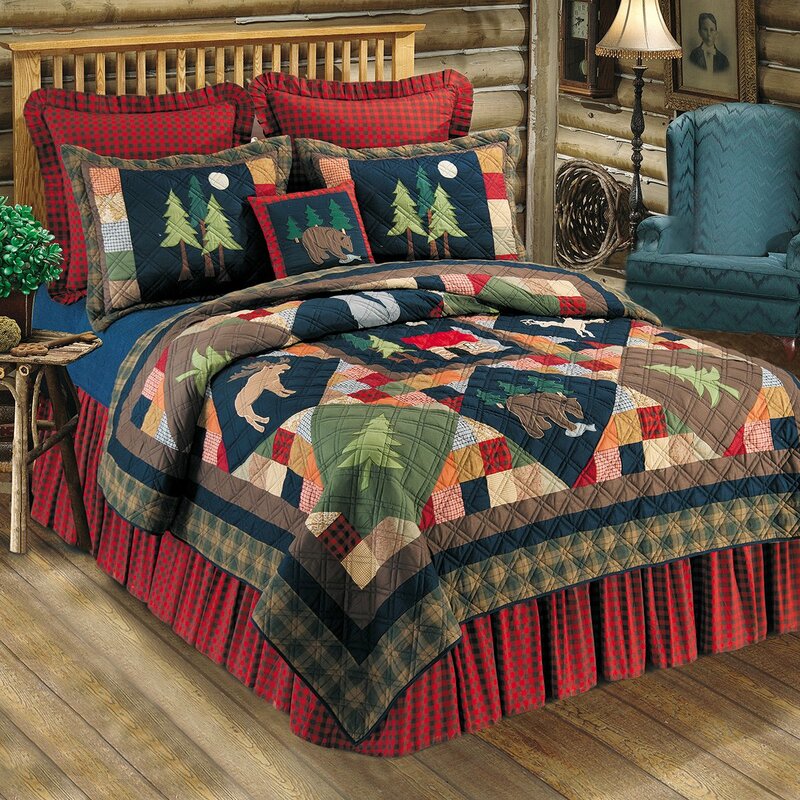 Create a Rustic mood with the Colorado cabin quilt set with this beautiful Bedding Set!! 100% cotton with vermicelli stitching for a subtle texture. 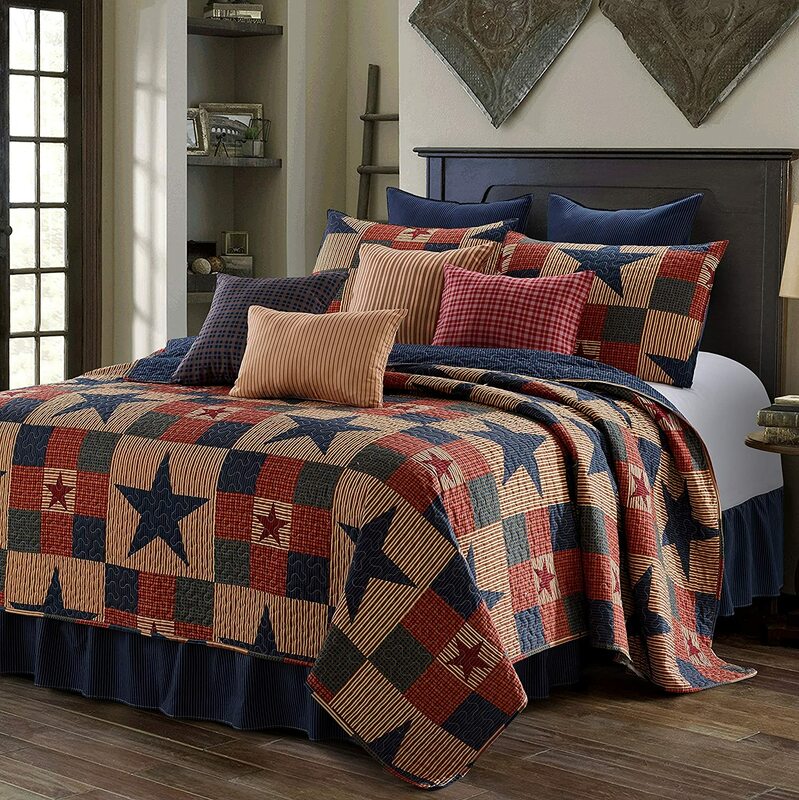 This heirloom quality quilt delivers authentic patchwork styling. You will be very happy with this purchase. It is Awesome Throw Quilt!! 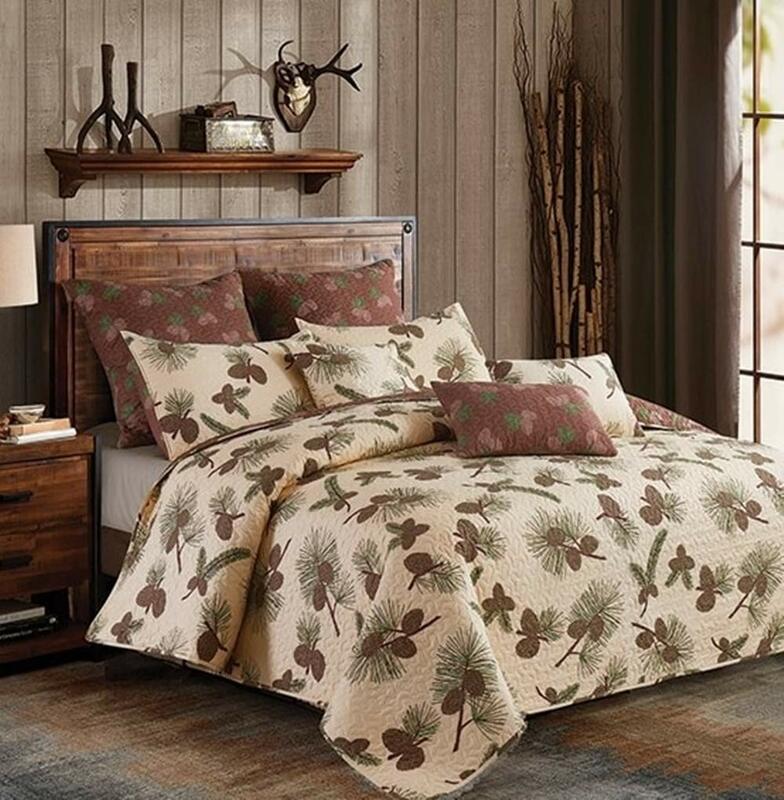 Tallmadge is a traditional log Cabin quilt with warm earth tones of Green, Tan, Brown, and Maize. Great Style and Colors for Country Primitive Design!! It is very beautiful and looks gorgeous!! 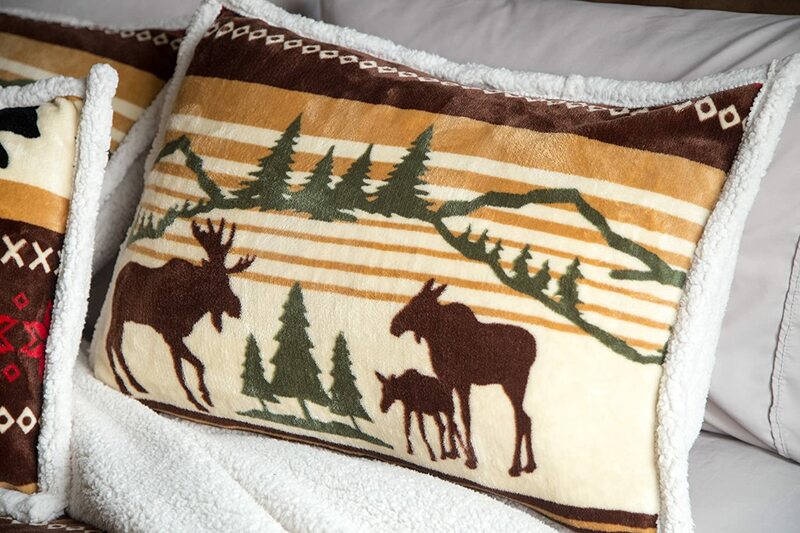 Tallmadge Deer Pillow Cover is 100% Cotton and the Quality is very nice!! The Dakota Star collection is made by the combination of Black and Khaki Colors. It is 100% Cotton and love Cotton, because it is always good for your Skin. It features a traditional 8-point star in the center, surrounded by a feathered star quilted pattern. Quilt, Bedskirt, and Two Standard Pillow Shams. 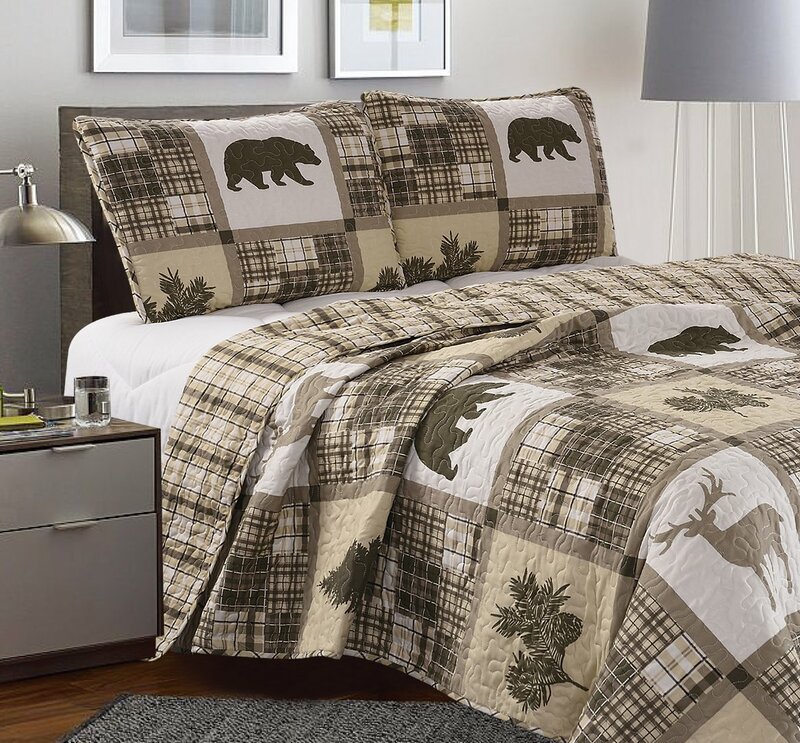 Timberline is a rustic themed quilt that features appliqué standing moose, prowling bears, and bounding deer that are centered around a Cabin scene accented with pine trees. Colors include Navy, hunter Green, Red, Tan and Brown and all these colors are blended with each other so nicely that they make this Bedding set Unique and Gorgeous!! Fabric of this Set is 100% Cotton. 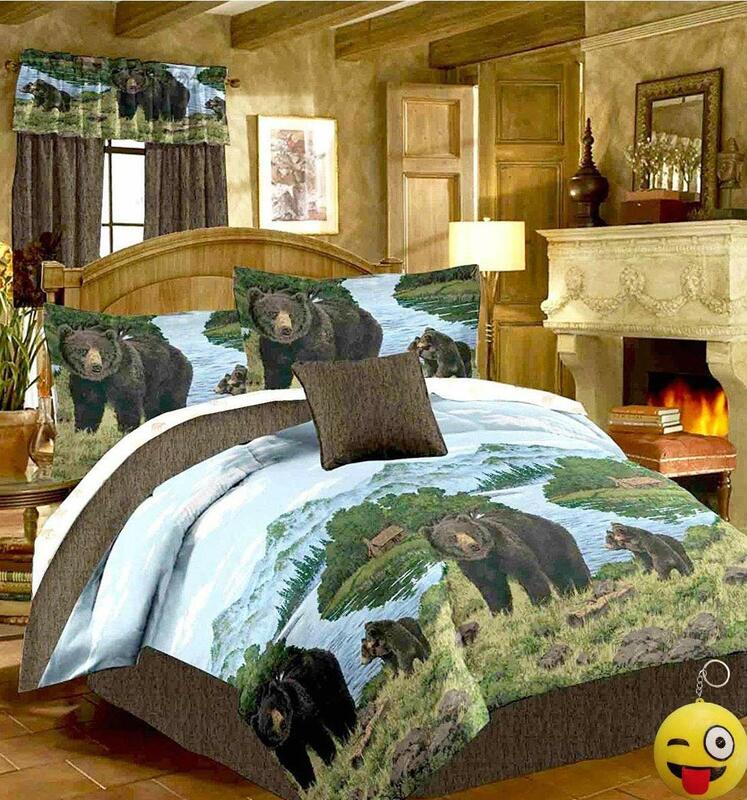 This beautiful Bedding Set is made from plush, super-soft 90% acrylic/10% polyester, the Bear Adventure Fleece Accent Pillow makes any bedroom feel like a rustic cabin getaway. This rustic bedding is machine washable. Measures 18″W x 18″L. For even more offerings, we encourage you to take a moment to peruse our thorough assortment of at Black Forest Decor today. Rich Brown Green Navy Blue and Maroon Colors on Featuring Plaid Patterns and Great Outdoors Destination and Vacation Rentals Signs on Soft Microfiber. 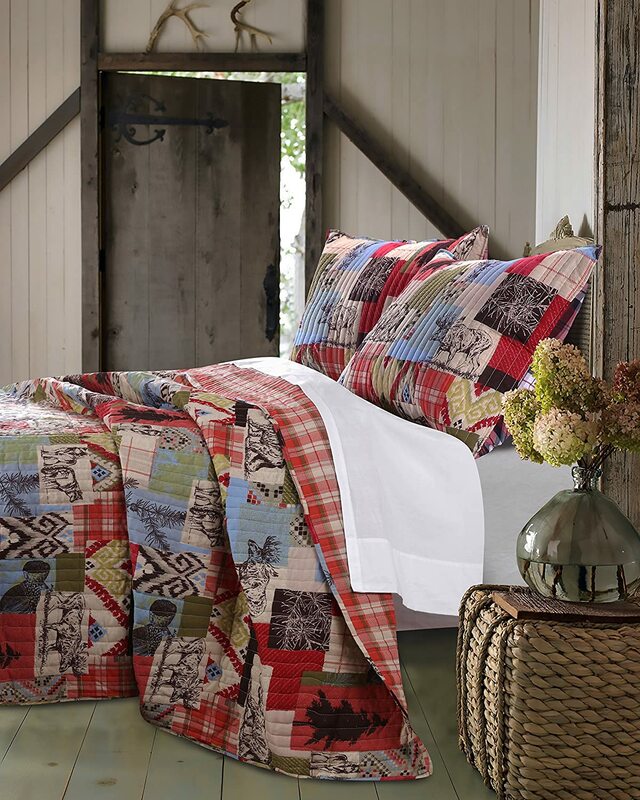 Spend the day exploring the great outdoors then slip into bed surrounded by this cozy quilt set from C&F Home. 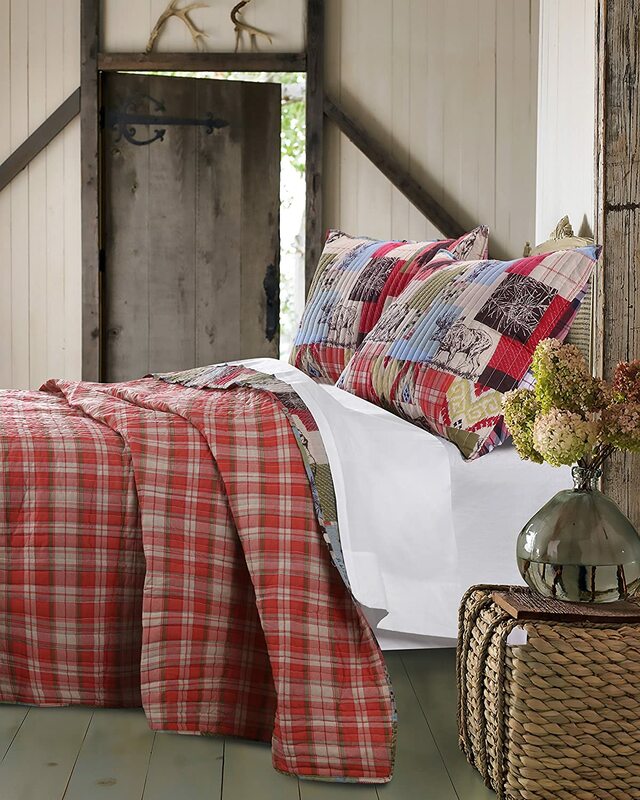 Crafted of cotton, this reversible bedding set includes a quilt and coordinating sham(s). Machine washable for easy care. Twin sets include 1 standard sham and 1 quilt. Queen sets include 2 standard shams and 1 quilt. King sets include 2 king shams and 1 quilt. Additional accessories sold separately. Reverses to a coordinating Plaid. Beckham features 100% cotton stitch-in-the-ditch hand quilting with rustic plaids in blacks, russets, and khakis. This Quilt is Reversible and reverse to solid black. Available in quilts and bedding accessories and bath coordinates. 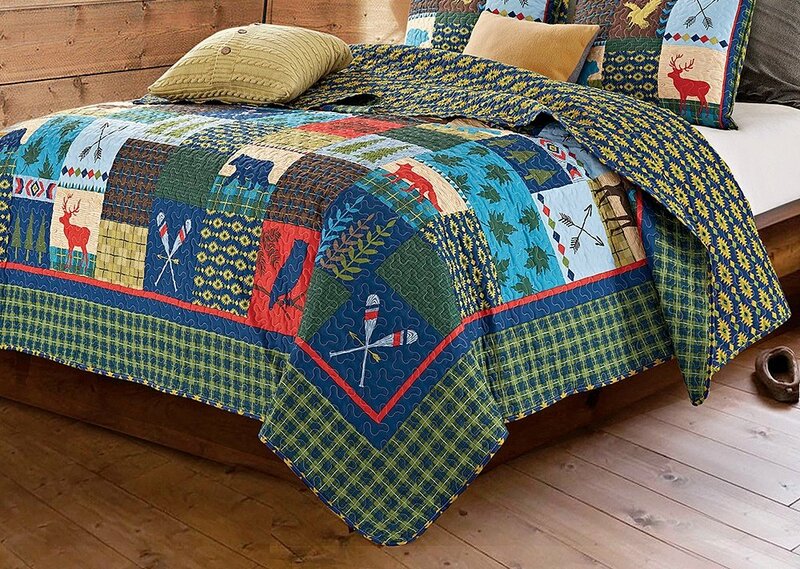 Bring the spirit of the great outdoors inside with the Rustic Lodge quilt set. Featuring moose, bear, pine trees and primitive art in a picturesque collage and a coordinating Plaid in natural colors on the reverse. 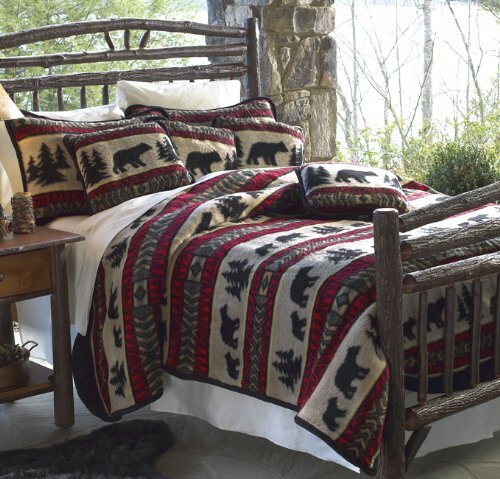 Rustic Lodge quilt set is perfect for your mountain retreat or cabin. It is 100% cotton face, microfiber back and polyester fill. 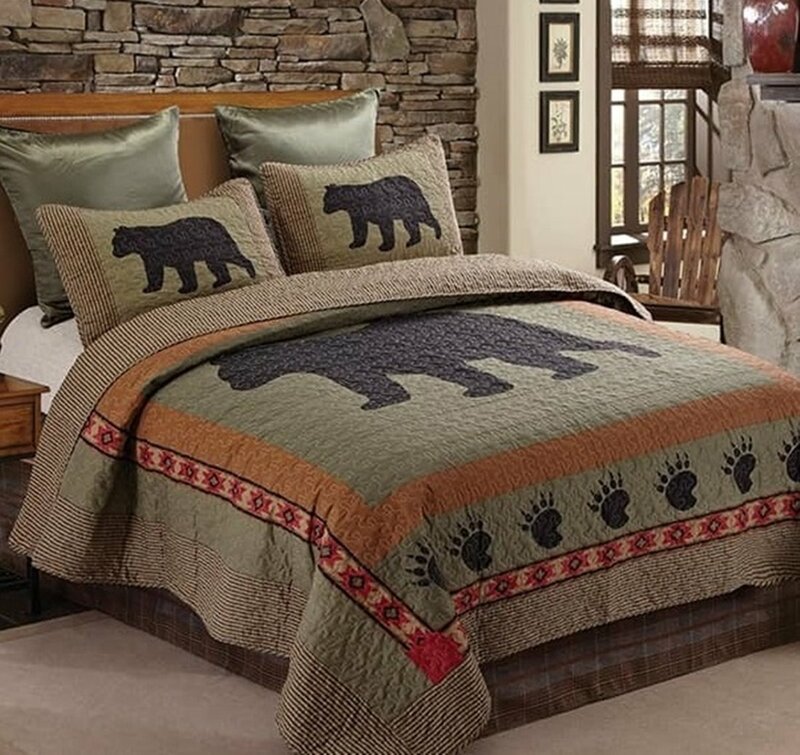 Rustic 3 piece Quilt Set features a large Black Bear Printed across the Sage Green face of the Quilt and Pillow Shams framed by a Terra Cotta Border and accented by Bear Prints and a colorful Southwest Aztec Print with an all around Green and Brown Plaid Check Border, Quilt reverses to the same Plaid Check print and features vermicelli stitching throughout for textural interest. A Beautiful focal point for the Lodge Décor! 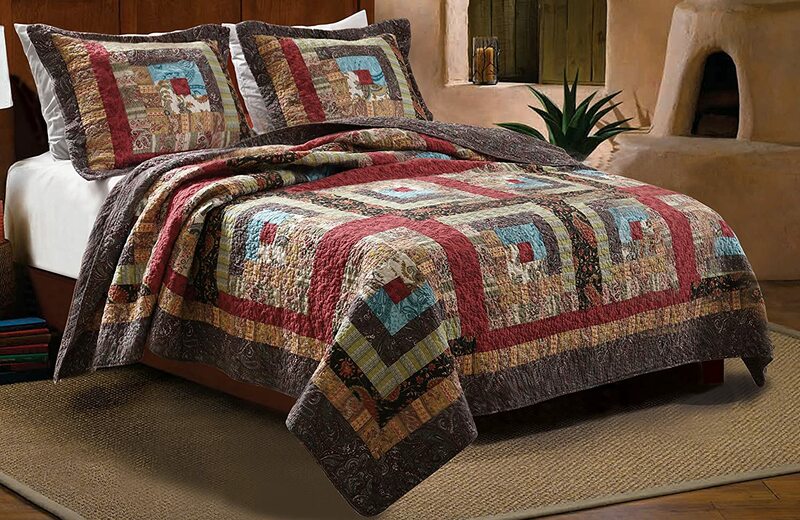 Create your own western retreat with soft bedding made from microfiber faux suede fabrics. 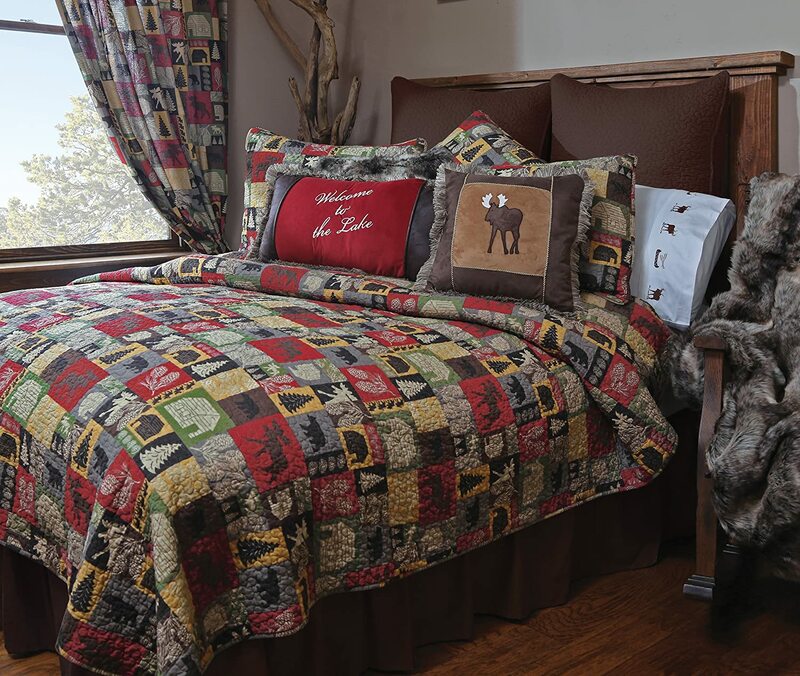 Add an array of western accent pillows western shower curtains, western throw blankets and much more bedding . A room with the right bedding is warm, inviting, and loaded with down-home appeal. It makes for a great place in which to spend time with family and friends. And, when you want to have a little privacy, a bedroom with great bedding can become a welcome retreat from the demands and distractions of a busy day. Quilts reverse to solid black. Available in quilts and bedding accessories and bath coordinates. Twin, Queen, King and Luxury King sizes available. Lightweight design is great for year round use. Soft to the Touch, Bold Vivid Colors bring style to any bedroom. Perfect for a cabin, lake, lodge, or nature themed bedroom. Snuggle into the comfort you crave! our cabin in the woods collection brightens the bedroom with its cheerful colors and playful patchwork. Moose, bear, branch and tree patterns are a snapshot of the great outdoors, while the Log cabin design pays tribute to the plucky pioneer. The delightful Jigsaw stitching of the quilt is mirrored in the euro shams in lovely tone-on-tone brown. Accessorize with a gathered bed skirt and coordinating pillows, and your cabin has never looked cozier. A lovely focal point for the log cabin or country decor! 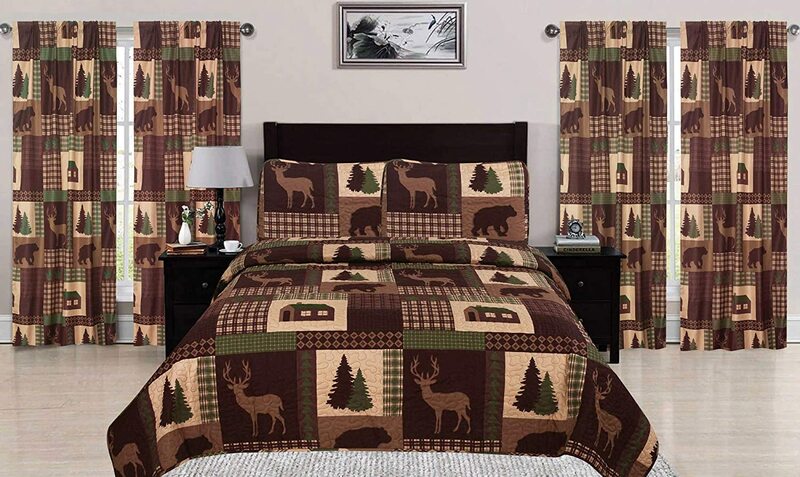 Great for Christmas holiday decorating~brings a rustic nature/woodland wildlife theme to the Bedroom!